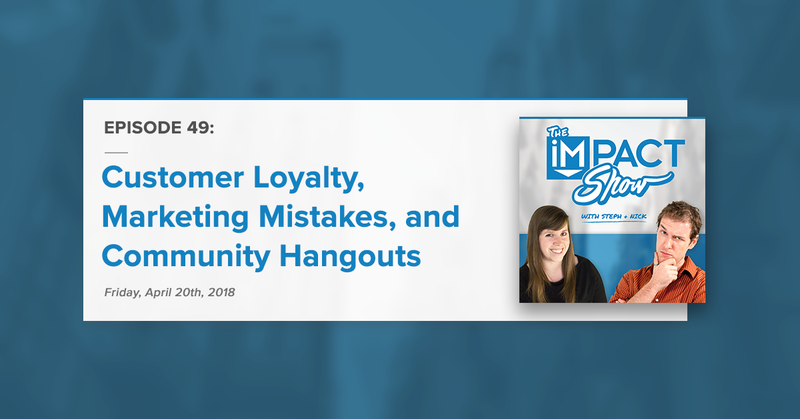 In this week's episode of The IMPACT Show, Nick and I talk about customer loyalty, cringe-worthy marketing mistakes and the lessons learned from them, community hangouts, and a whole lot more. Enjoy and make sure to share! We had our webinar with Joey Coleman last week on how to never lose a customer again. We've been sharing lessons we've learned throughout doing our last few webinars and, after a huge team effort, we nailed it this time. Joey was a fantastic presenter who also helped with some really authentic, fun promotion. He also was great at wrapping up the webinar with a recap instead of just ending on a question. We loved this idea (we may steal it for future use!). - Do a dry run. Practice and be prepared. - Give yourself enough time to promote well. - Work with guests who are excited to work with you! We also just love the content of the webinar! Have you read Joey's book? Did you watch the webinar? Let us know your thoughts - keep the conversation going in Elite. Have questions about our webinar process? Ask us in Elite or share your tips! As for our next webinar - it's coming up on May 10th! IMPACT Elite is a community of over 2,700 passionate inbounders looking to help other marketers (and sales and customer success people) succeed. We’d love for you to join us! Go to impactbnd.com/elite or just search the IMPACT Elite Group on Facebook and request to join. Plus, join us LIVE and in person this August at IMPACT Live 2018. Elite member Kaitlyn Casso was featured on an episode of MarketHer this week! She talked all about getting out of your comfort zone and she mentioned a quote that I just love. It was: "perfection is the enemy of authenticity." I love that so much. Check out the episode of MarketHer to hear more about what Kaitlyn had to share. We love that Juan shared this! We all have experiences like this and it's great that we can share these stories so we know we're not alone but we also learn the lessons from each other. I love the topic so much that I'm turning this into a blog post. So, if you have a story to share please let me know in Elite! Want to come together in PERSON? LIVE? Join us at IMPACT Live 2018! This is where we talk about what we’re doing and what we’ve learned lately right here in the trenches. - Get some experience! Speak at smaller events, attend events you want to speak at, etc. Nick's topic is "Become and Inbound Sales Ninja: One Team's Ultimate Playbook for Success with HubSpot Sales Pro." Stephanie's topic is "5 Steps to Future-Proof Your Marketing Skills Against the Rise of the Robots." 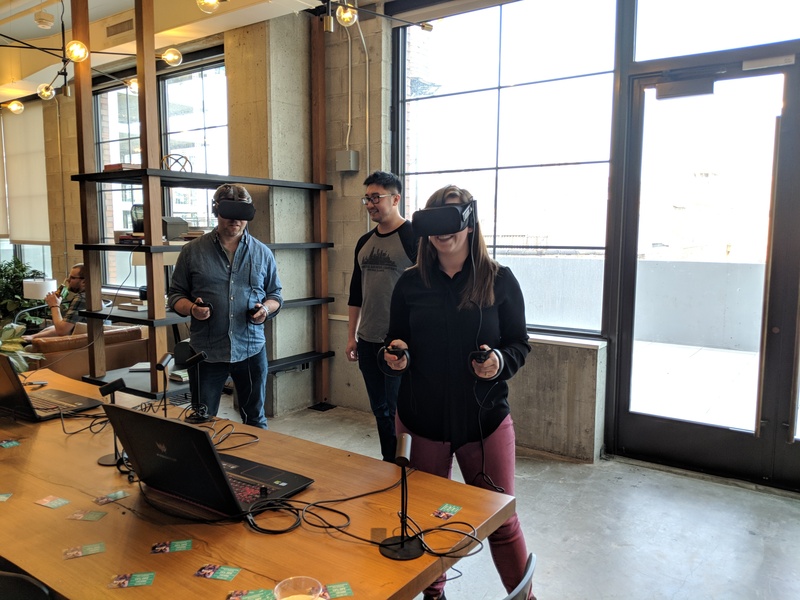 Speaking of the rise of the robots... as Nick and I prepped for this episode of the show, there were some people setting up a virtual reality happy hour at my co-working space. It was such a cool experience! We did everything from games to a Google Earth experience, to virtual tours of the new living spaces opening in our building. This is part of why I'm so passionate about my INBOUND topic - it's easy to get afraid of new technology but, if we can embrace the future of marketing technology, we can do a lot with it. So, I'm stoked to speak at INBOUND about how we can leverage marketing technology and future-proof ourselves as marketers. The IMPACT Show will now be every other Friday! So, we won't have an episode next Friday but we will have something brand new: a community hangout! This is where we can come together on a Zoom video call and actually chat in person! Each week that we do this will have a theme. You can only get the link to join if you're in Elite so if you're not already in Elite - now is the time to join! Nick will be speaking at the Boston HubSpot User Group on May 17th and Stephanie will be at the Digital Innovator Summit in Chicago on the same day. Will you be at either event? Let us know in the comments or in Elite! We would love your comments. What did you think of the show? Let us know in Elite. Make sure you never miss a show or update by subscribing at impactbnd.com/show. Upcoming Webinar: 3 Ways to Predict Your Marketing Future Using Machine Learning & AI with Christopher S. Penn on Thursday, May 10th at 2:00PM ET. We'll be back again next in TWO weeks on Friday, May 11th at 11:00AM ET. Mark your calendars! Until next time...we'll see you in Elite!